Floor, Willem, & D. T. Potts. 2017. 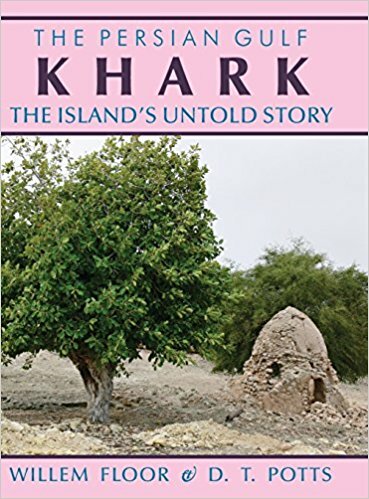 The Persian Gulf: Khark: The Island’s Untold Story. Mage Publishers. The island of Khark was an important link in Persian Gulf navigation, supplying passing ships with water, victuals, and pilots for ships sailing to and from Basra. This was why the Arabs called Khark the Mother of Skippers (Umm al-Rubbaniyan). Through the ages, Khark has also been a place of pilgrimage: in Sasanian times, due to the presence of an early Christian church and monastery, and in Islamic times, because of the presence of the tomb of Mohammad al-Hanafiyya. In the eighteenth century, the Dutch made the island their center of trade in the Persian Gulf, and by the nineteenth century the island was dubbed the most important strategic point in the Persian Gulf, reason why the British occupied it twice. Although by 1900 the island had lost its strategic importance, it acquired it again after the 1950s, when the National Iranian Oil Company decided to make Khark its main terminal for the export of crude oil. Later, chemical factories were added to the island’s economic make-up. As a result, Khark s name is now better known around the world than it was ever previously, but the history has remained untold. This book tells the whole story, from the early archeological evidence and the Islamic and Safavid periods, to the Dutch projects in the eighteenth century and the British in the nineteenth century. And in the end, how the traditional way of life ended and industrialization began.